A great biography full of faith-filled adventure. Andrew had always been one for adventure, but his greatest adventures came after he gave himself for whatever God would have him do. The pre-conversion Andrew shows some amount of rebelliousness, ego, and wildness of nature. He is extremely patriotic and family-bound. Post-conversion, his life completely turns around and he ends up defying Communist governments by exploring their lands on his own and smuggling Bibles and tracts in to the people. Until his twenties, Andrew rejected Christianity even though he was surrounded by believers. When he converted, he was a die-hard zealot. While in missionary training, Andrew learns all the materials he will need for ministry. Andrew sets off a cherry bomb near German headquarters. He joined the Dutch Resistance at twelve. At eighteen, he joined the army and joined in the fight against Communists and guerrillas in Indonesia. (At first, fighting filled him with excitement, but it eventually died away.) Some men walk into a nest of land mines and Andrew's company opens fire on a village. The image of a mother and her baby in a pool of their blood haunts him. During his soldiering days, Andrew and his comrades turn to gin to drown their problems. Andrew shares the Gospel with a drunk man. This is a great biography that gives you the high points of Brother Andrew's career as God's secret agent and contrasts it with his pre-conversion life. Brother Andrew is an excellent example of what God can do with your life, no matter how unlikely, if you'll surrender your will to His. 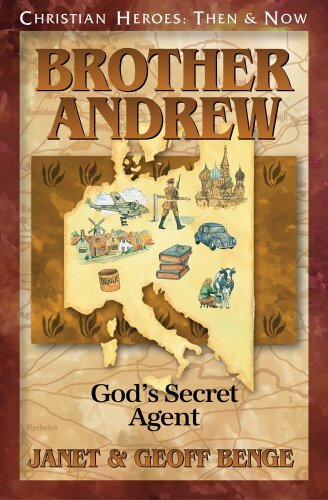 Note: SCR also has a review of Brother Andrew's autobiography, "God's Smuggler."